But even that remarkable legacy may not be enough to stop the beginning of the end for the chicken and waffles chain. In 2013, Roscoe’s — perhaps one of the most prominent black-owned businesses in Los Angeles — was sued by a former employee named Daniel Beasley. Beasley, a black man, claimed that Latino managers gave preferential treatment to Latino employees — including unfair treatment, issues with shift scheduling and ultimately, his dismissal. The fees and damages awarded to Beasley — $3.2 million total — make up a significant part of the $14 million and change in estimated debt cited by Roscoe’s parent company East Coast Foods in its bankruptcy filing. As speculation began over whether the famed chain would have to close down, rapper and Roscoe’s fan Snoop Dogg joked that he might have to step in, telling a TMZ reporter “I guess I’m gonna have to buy it, man.” In an attempt to encourage racing fans to support Roscoe’s, Professional driver Tom Pappas drove a Roscoe’s-themed Dodge Viper in April’s Long Beach Grand Prix. “Roscoe’s House of Chicken and Waffles is a franchise unlike any other, and we’re proud to support them,” he said. Thus far, however, Roscoe’s has no plans to close down or sell — much to every Angeleno’s relief. After all, Roscoe’s might not be what it is without Los Angeles, but what would Los Angeles be without Roscoe’s? In spite of its Hollywood location, the original Roscoe’s doesn’t court glamour, and if you don’t know what you’re looking for it can be easy to miss. It’s tucked just north of Sunset Boulevard on Gower. On your first pass down Sunset you might only see a flash of pink neon cursive and a throng of people crowding on the sidewalk. Another look and you’ll see the famous sign: a rooster with wings outstretched in front of a round waffle and emblazoned with the restaurant name. The restaurant somehow evokes country comforts on its urban Hollywood block. The outside walls and doors are lined with warm diagonal wood paneling, and inside, the menu offers home-cooked food at its best. The warmth of the wood (and grease on the chicken) suggests soul food’s rural origins, while the neon lights out front remind you that you just might be dining elbow to elbow with one of Roscoe’s famous friends. On one side of the smaller of two dining rooms there’s a photograph of President Obama from 2011, carrying his takeout back to his motorcade. Another painting depicts a typical Roscoe’s crowd: clubgoers eager to refuel after a long night, young families grabbing brunch after church, old men swapping stories, and of course, a crowd of people in the front, waiting to be seated. Another thing is clear from Roscoe’s decor: It’s a space that unapologetically centers blackness, celebrating black contributions to American life. 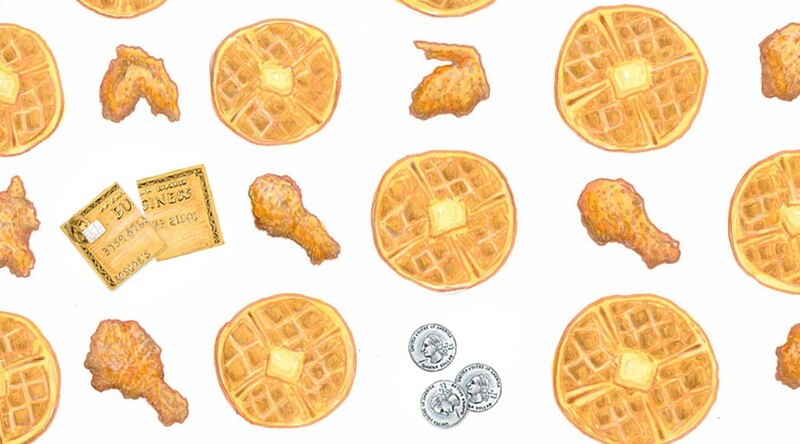 Not that Hudson was the first: There’s a long tradition linking chicken and waffles to black celebrity culture. Harlem legend holds that the chicken and waffles combination was invented in the 1930s by Joe Wells, the owner of Well’s Supper Club in Harlem (also where Nat King Cole had his wedding reception, in a neat generational link to Roscoe’s). Wells served the pairing to feed jazz musicians who would get off work between dinner and breakfast hours–too late for dinner and too early for breakfast. However, as Miller writes in Soul Food, German settlers were serving waffles topped with chicken and gravy in early 19th-century Pennsylvania, and cooks in Southern kitchens — most of them enslaved African Americans — substituted the fried chicken that was already becoming a Southern staple. After Emancipation, many African American cooks left the South, taking their recipes with them as they went into domestic and commercial employment. Before long, fried chicken and waffles had become an emblem of a particular kind of homey hospitality in restaurants and hotels across the country — including in Los Angeles. A fried chicken and waffle plate is the refreshingly simple, old-fashioned specialty that makes Mildred’s restaurant so successful in the 1941 James Cain crime novel-turned-Oscar-winning film, Mildred Pierce. But while the servant class in Cain’s Los Angeles is vaguely multiethnic, Mildred is white and middle-class. As so often happens, Cain’s novel erases the contributions of black women and men in favor of a narrative that credits white ingenuity in the service of white consumption. So what’s the draw? For many tourists and first-time visitors, it’s undoubtedly the novelty of the restaurant’s signature combination, the salty-sweet-savory flavor profile and the meeting of textures in the crispy fried chicken and the fluffy waffle. But for others, it’s the familiarity of the food they like best. Tynitra Wilson grew up in the San Fernando Valley and fondly remembers her first trip to Roscoe’s with family and friends: “The greens [are] very similar to the way my family makes it, and that’s the first time I’d had greens like that in a restaurant.” For others, Roscoe’s is an essential late-night stop, the only way to finish an evening out. As a longtime resident of nearby Glendale, David Okonyan made frequent visits to the original Hollywood location after concerts at the Fonda Theater, just a few blocks away. “That was back when I was cool,” he says. Roscoe’s might mean something different to each visitor, but you’d be hard pressed to find someone who doesn’t think of it with affection. Roscoe’s also has a political significance that goes beyond its celebrity cachet and solid four-star Yelp ratings. In a city that has often been overtly hostile to its black residents, it’s a proudly black-owned business. Hudson and East Coast Foods are so tight-lipped about the corporate structure governing the chain that an appellate court judge scolded them for “obfuscation” in 2012. But legal documents confirm that four of the seven restaurants are owned by East Coast Foods, while others are owned by Shoreline Foods and Freeway Foods, and the appellate judge found substantial evidence that Hudson, the sole officer of East Coast Foods, “exercised control” over them all. The chain also has a deep investment in the L.A. neighborhoods south of the I-10 Freeway, where two of its restaurants are located. According to the Los Angeles Sentinel, Herb Hudson built the still-standing shopping center Waffle Plaza — anchored by a Roscoe’s restaurant — in 1991 in an attempt to shore up failing black-owned businesses in the area. And over the years Roscoe’s has sponsored dozens of local sports teams and community events, including a series of Peace Bowl games and conciliatory breakfasts between high school football teams with ties to rival gangs. According to Roscoe’s PR manager at the time, Jai Rich, they hoped the Peace Bowls would ease tensions in the community and show outsiders that there was more to South Central than violence after the LA Riots in 1992. But perhaps because of its fame, politicians have also used Roscoe’s as a political prop — holding press conferences outside in order to burnish their credentials with black voters while attacking their rivals. And it’s the place mayoral and presidential candidates from both sides of the aisle visit to signal their knowledge of black culture and their commitment to black Angelenos. Whether Roscoe’s likes it or not, it has become a symbol of all that Los Angeles says and does not say about its racial stratifications. Despite Roscoe’s rich history, its lawsuit points to longstanding racial tensions within the Los Angeles restaurant industry — tied to issues of immigration, exploitation and social mobility. As Daniel Melero Malpica notes in his dissertation, Indigenous Mexican Migrants in the City of Los Angeles, the L.A. restaurant industry has long been seen as a site of mobility for recently arrived immigrants and the commercial kitchen is a space where advancement can occur through collaboration across informal social networks. In the case of Daniel Beasley, the evidence of preferential treatment against Roscoe’s was strong enough to convince the jury to vote unanimously on almost every charge. East Coast Foods has appealed the judgment, and that appeal is pending, but Beasley’s attempts to collect damages in the meantime were the “final trigger” leading to the bankruptcy petition, according to documents filed by East Coast Foods on April 27. The bankruptcy promises to be a difficult and fiercely contested one. In a series of documents filed over the last two weeks, Beasley’s attorneys have alleged that East Coast Foods is inflating its debts and expenses in order to avoid paying damages, while the company has accused Beasley of “slanderous, meritless, and unsupported” statements designed to “derail the reorganization process” (reorganization involves making a plan for how the various creditors will be satisfied, as well as how the company will continue to operate). Beasley’s attorney was unable to provide comment in time for this story, and East Coast Foods’ attorney did not respond to requests. East Coast Foods won’t file its reorganization plan until October, and it will likely be some months after that before anyone knows Roscoe’s ultimate fate. Hudson certainly isn’t saying. Court documents suggest East Coast Foods is willing to forgo the leases on some of its properties, which could mean some locations will close or relocate. Either way, Roscoe’s is still doing solid business across the Southland, celebrating its 41st anniversary this year. Regardless of whether it survives to see 42, Roscoe’s legacy is an enormous and complex one, equal parts appealing and puzzling. The Roscoe’s organization has dedicated itself to L.A.’s black community, and its culinary fame is a source of local pride. But it has also allowed a workplace culture to develop which led a jury to vote unanimously that Roscoe’s not only “fail[ed] to take all reasonable steps to prevent” racial discrimination and harassment in its restaurants — they met an employee’s complaints with “retaliation” instead of concern. It’s the kind of thing that seems like it should be talked out with friends over fried chicken wings and a syrup-coated waffle in the wee hours of a Saturday morning. Sharone Carmona is a writer in the Los Angeles area. She is co-author of The Routledge Introduction to American Women Writers. Can Roy Choi Disrupt Fast Food?